#2645 newly restored, August 21, 2004. Paul Swanson photo. 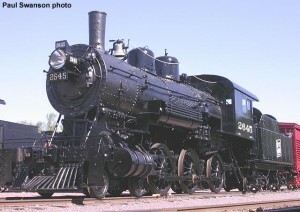 The #2645 was built in 1900 by Brooks Locomotive Works for the Wisconsin Central as their #247. The Minneapolis St. Paul & Sault Ste. 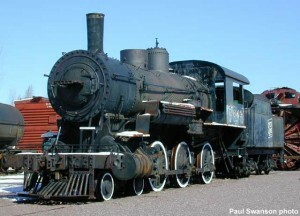 Marie (commonly known as the “Soo Line”) leased the Wisconsin Central in 1909, and the locomotive became Soo #2645. A Wisconsin engine for most of her career, she worked such locations as the Eau Claire branch, the Portage and Manitowoc lines, and served as a switcher at such locations as Neenah and North Fond du Lac. #2645 on display, April 2000. Paul Swanson photo. In 1952, at a time when steam locomotives were quickly being sent to pasture, #2645 received a reprieve. She was sent through the North Fond du Lac shops for Class 5 overhaul (the most extensive overhaul involving substantial repairs to the boiler). Upon completion, she was assigned to Neenah. After accumulating over one million miles in 55 years of service, the Soo Line retired #2645 and donated her to the City of Waukesha on October 29 of that year. At the time, #2645 was the last ten-wheeler (4-6-0) in service on the Soo Line system. #2645 at Neenah, WI, 1953. Bill Raia collection. 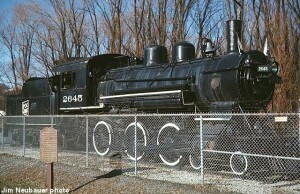 After several years on display at Frame Park in Waukesha, the engine was moved to a railroad-themed restaurant housed in a former C&NW depot at Waukesha in 1972. There, #2645 remained on display until a realignment of ex-C&NW track for a new connection between the Wisconsin Central (former Soo Line) mainline and Wisconsin & Calumet Railroad required that the engine be moved in 1989. On September 20, 1988, the Waukesha City Council donated #2645 to Mid-Continent. Volunteers quickly sprung into action and prepared the locomotive for movement to North Freedom on her own wheels. #2645 arrived on property in July of 1989. She received a cosmetic restoration for the Soo Line Historical & Technical Historical Society’s annual convention during the summer of 2004 and now is on display near the freight house, across from the depot. North Fond du Lac, WI, Sept. 11, 1951. Bill Raia collection.